So I've been working in the home office ALOT lately and ended up with shoulder, neck and knee pain. Yesterday I finally decided to OSHAfy the place and see what happened. It turns out I've had my chair too low my whole life. Instead of stretching my legs or crossing them on the chair, now I can comfortably put them on the ground. My knees already feel better. I put my monitor in a more unnattractive space. Now I don't need to contort my body in order to face the corner. Plus the Wacom's placement means my arm has plenty of space of rest, instead of just hanging off the table. This immediately eliminated my right shoulder pain. Today I got a monitor lift. Having such a tall monitor feels odd but I don't need to look down at the bottom of my screen. My monitor is 23" so I did a lot of head tilting. 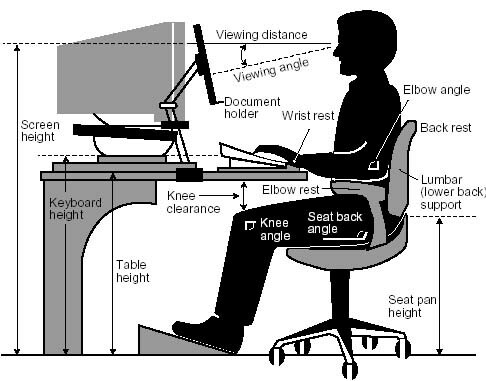 I hope an elevated monitor will take away my neck pain. Yes its grody, but its also five years old! I replaced my generic Dell with an ergonomic one with a built in wrist rest. I love that red Kensington rest but its so old and I spilled water on it last week, resulting in those stains on the bottom left. I wouldn't buy another fabric coverred wrist rest - look at how pristine the rubber right side is, despite getting plenty of use! This room doesn't have overhead lighting so I've been having a ton of eye strain lately. There is a floor lamp on my left and desk lamps on the right but I really need one behind me as well. So that's next. I've never used one so I want to try it out in store and maybe stack a box under my feet to see if I like it first. This is something else I'd like to try out in store first. I have mild scoliosis and want to make sure something is comfortable for my body shape before purchasing. So baby steps, but I really need this stuff if I'm going to be working such long hours in here.